What is the size, location, and frequency of the class? What external demands am I expected to meet? What does society, government agencies, my university, and my department think is important? Is the subject one in which there is a single set of correct answers or multiple, often conflicting but equally valid, interpretations? What lives do my students live, especially in terms of barriers to and opportunities for learning? What prior knowledge, skills, or experiences do they possess? Why are they taking the course? What do I bring to the course, in terms of knowledge, experience, and teaching skills? Using these questions as a preliminary environmental inventory can greatly improve a course and the satisfaction that comes from teaching it. 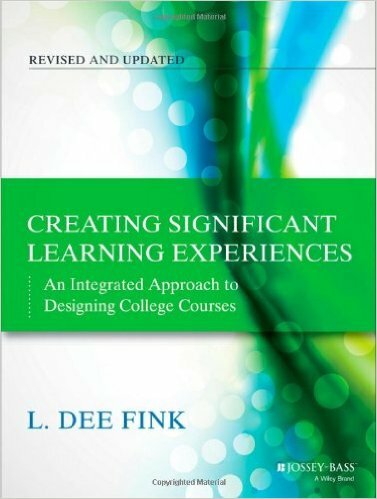 In regards to the mechanics of the course itself, Fink supplies numerous examples of engaging students at a meta-cognitive level, where they ask themselves the questions of “What can I learn?” and “How can I learn it?” This is a useful method for incorporating problem-based learning into a course. Change policies related to faculty work and to the evaluation of teaching. Improve procedures for evaluating teaching. Establish teaching and learning centers. Coordinate student development with instructional development. In future posts, I’ll apply Fink’s method to a course that I’m designing for the fall semester. *Kudos to Amanda for citing Fink in one of her slides during the workshops in Surrey, which reminded me of this book.